I’ll be the first to admit I know little about football. But the drama of Friday nights down South? Those stories are worth the ticket price. 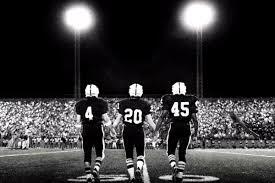 After all, Friday Night Lights owed its television success to being a football show that wasn’t about football. Every time I watch Coach Taylor mold boys into men, I add a new play to my writer’s handbook. 1. Raise the stakes. This show wasn’t just about high school football, but Texas high school football. Not only the best team in Texas, the Panthers are considered the best in the nation. Their stands are full of scouts. As if that’s not enough, it’s Coach Taylor's first year as head coach. Talk about pressure. When you’re at the top, you only have one place to go, right? So the high stakes story becomes all about how the characters handle the fall. 2. Introduce the players. Whether script or a novel, whenever multiple characters pull equal weight in a story, you’ve got to introduce them quickly—and succinctly. FNL handles this wonderfully in the series premier by having the boys interviewed for a media outlet. With a few sentences, we learn which player is cocky, which one is terrified, and which one is full of grace. 3. Make them honorable, vulnerable, and human. Once your cast is on the page, make them relatable. Every story needs a hero who demonstrates humility, but we also need those characters who exist in our real life. Unfortunately, real life isn’t edited, and when you deal with hard issues, you make your characters resonate more with your audience. 4. Say less, show more. Movies and television shows don’t have it any easier with “show don’t tell.” It could be all too easy for them to get caught in the dialogue trap. But on FNL, when the worst thing happens during the season opening game, the writers didn’t opt for actors recounting the situation. Instead, they gave us images—like the players linking hands when Matt gets called on to captain—and they gave us silence. When a football stadium gets quiet, you know it’s bad. Then those boys drop to their knees and lift their voices to plead for the wellbeing of their teammate, and I never fail to cry. It’s easy to have a character say—or think—how they feel. But readers react when the character faces an uncomfortable situation and proves who he’s going to be. Offer a uniting goal. Everyone in Dillon, Texas believes football is the ticket. To a way out. For community pride. For a better life or situation for their family. But all these very different people have one common goal—the success of their beloved football team. That unites them, and it could even destroy them. But this one goal creates the tension a story needs to drive the reader to the next page, the next scene, the next book. Your turn—is there a show that challenges you to raise the stakes and write better? Award-winning writer, Lindsey P. Brackett just writes life — blogs, columns, articles, and stories — in the midst of motherhood. As Web Content Editor for Splickety Publishing Group, she publishes pieces of flash fiction and writer wisdom for those who love a good story and have limited time. Her debut novel, Still Waters, a Lowcountry story about the power of family and forgiveness, releases in September. Connect with her at lindseypbrackett.com, on Facebook at Lindsey P. Brackett, on Twitter and Instagram, or email blog@splickety.com. Who Knew, It Could Be Me? Can a Vampire Virgin Write Paranormal? HIRING A PUBLICIST . . . A GOOD OR BAD IDEA?